Bloodshed on Independence Square (Maidan) and rumors of worst yet to come have prompted panic among Ukrainians, with many fleeing the country and those who stay emptying shop shelves, queuing for gasoline and making big cash withdrawals from banks. The mood is a pre-war one in most Ukrainian cities, where people, afraid of the country falling deeper into economic paralysis, are trying to buy up as many essential foods and goods as they can. Fearing stampedes, some Kiev shops have started limiting the amount of shoppers at any one time. Some shop-owners confess they are running out of stocks to refill the fast-emptying shelves, and new deliveries are not expected anytime soon amid the current turmoil. Social media is swarming with pictures of over-crowded stores and scarce supplies. “This is not a joke. No bread, no eggs, only expensive imported spaghetti left, huge lines and this is in a small local village shop,” Instagram user @iartemka says, adding up a #PrayForUkraine hashtag. “People in the shops have gone mad. Huge queues, empty shelves,” Twitter user ‏@Helen_Marlen writes. 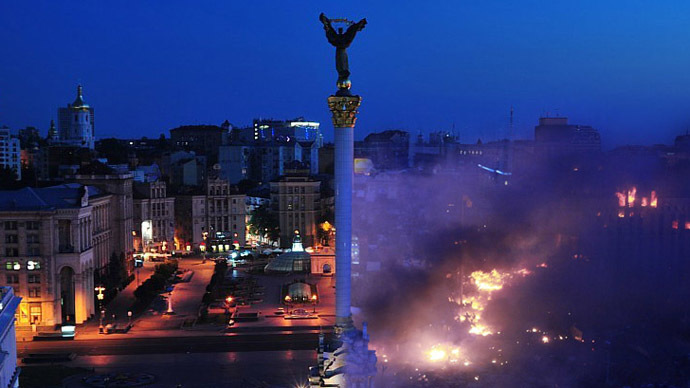 Kiev is witnessing a mass exodus. The number of those, who left the country this Thursday is reportedly twice as many as on the Thursday of the week before. Most people are heading for Odessa, Simferopol and Kharkov, the Ukrainian cities largely loyal to the government and less affected by the turmoil, according to Airticket UA, online travel agency, cited by The Kiev Times. With the local currency, the hryvnia, plunging to new lows with each ensuing day of the unrest, people are desperate to withdraw whatever money they can from their accounts. 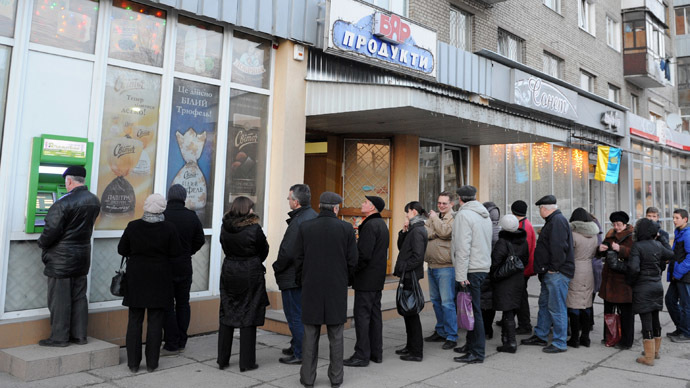 In many cities around Ukraine people are queuing for cash. What is aggravating the situation is the fact that many shops have stopped accepting credit cards. That creates fertile ground for rumors. “They will freeze all of the accounts tomorrow, everybody’s withdrawing, people are fighting in banks,” an instagram user writes. Banking experts are dismissing the rumors as absurd, but the people aren’t listening, preferring to get their cash out of the banks just to be on the safe side. The shops and banks frenzy is accompanied by another one at the gas stations. Kilometer-long lines of cars can be seen waiting for fuel amid rumors of a gas shortage supply. The huge leap in demand for gas immediately led to an increase in its price. 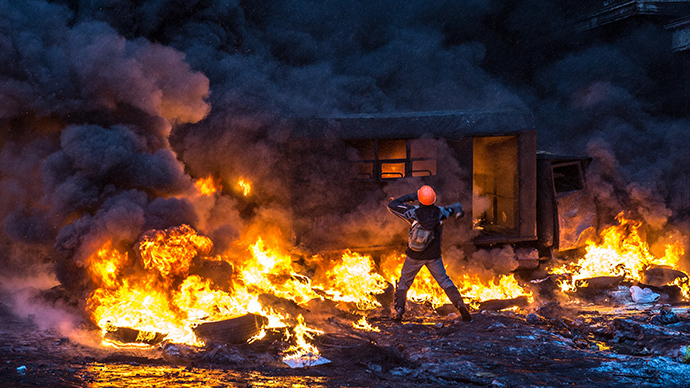 While the panic has spread all over Ukraine, it is worst in Kiev, where fierce fighting continues. There are reports of shops being looted in the center. 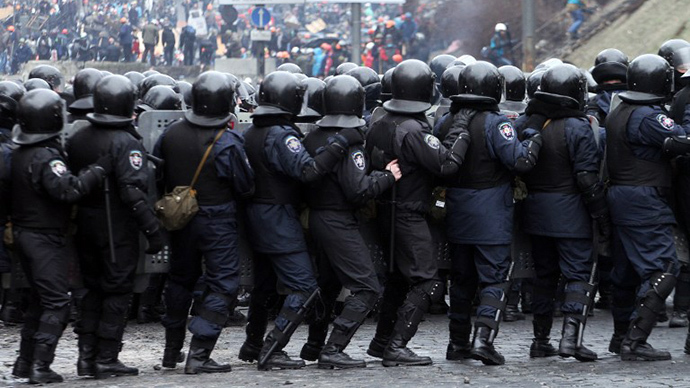 Residents of the Ukrainian capital have meanwhile started forming self-defense brigades, patrolling their own houses. "Criminals are walking around Kiev, we must defend our own neighborhoods,” Nikita, an activist from the Dneprovsky district of the capital told Ukrainian online magazine “Vesti”.